Get a behind-the-scenes look at the state's only veterinary school at the annual Veterinary Medicine Open House. Open House is on October 6, 2019! On Sunday, October 6, 2019, more than 300 veterinary students will host the annual College of Veterinary Medicine Open House. There will be more than 40 exhibits and demos, and lots of animals to see. This event is free and open to the public. See photos from the 2017 Vet Med Open House! 11 am, Admission to veterinary school, 2258 Basic Sciences Bldg. 2 pm, Admission to veterinary school, 2258 Basic Sciences Bldg. The College of Veterinary Medicine is located in Urbana, Ill., 140 miles south of Chicago, 120 miles west of Indianapolis, and 170 miles northeast of St. Louis. From Interstate 74, take the Lincoln Avenue exit south and travel about 3 miles. From Interstate 57, take the Curtis Road exit east; turn north on Route 45 (Dunlap Avenue), east on Windsor Road, and north on Lincoln Avenue and travel about one-half mile. The college is located at the southeast corner of the University of Illinois main campus. 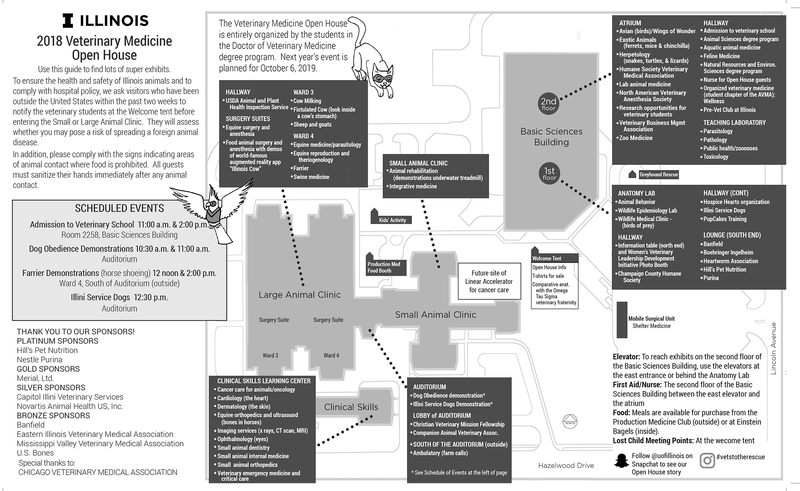 See a map view of the University of Illinois College of Veterinary Medicine. Additional thanks to the Chicago Veterinary Medical Association for their support. 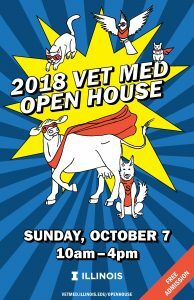 What Can You See and Do at Vet Med Open House? Thousands of people attend Open House, which has informative booths and exhibits throughout the veterinary campus, including in the Large and Small Animal Clinic, the Basic Sciences Building, and the Clinical Skills Learning Center. Most booths are open throughout the day, from 10 am to 4 pm, but some demonstrations occur only at scheduled times. Please check the program at the information tent when you arrive. Parking is free, and there are refreshments and meals available for purchase, as are veterinary-themed shirts and other apparel. A list of the exhibits and learning opportunities at Open House, grouped by topic, may be found below. Did you know that more than 9,700 species of birds have been identified? Birds can be found on every continent and in every ecosystem except deep ocean habitats. Due to this great diversity, learning avian medicine can seem a daunting task. Nonetheless, it is becoming increasingly important for veterinarians to at least know the basics of how to treat a sick bird that “walks” into the clinic. It is estimated that there are approximately 50 million pet birds housed in 15 percent of American homes. Veterinarians also need to be ready to answer questions about zoonotic diseases from birds, such as avian influenza. At our Open House exhibit, you can learn how to read a bird’s X-ray, identify popular species of pet birds, and find out about common avian diseases. Last, but not least, you can meet our colorful, loud birds who would love to say “Hello” to you! Some kinds of cows are used for beef (such as hamburgers and steaks) and others are used for dairy products (including milk, cheese, yogurt, and ice cream). cow milking. The breeds typically used for dairy products include: Holstein (black and white), Jersey (small and brown), Guernsey (big and reddish-brown), Brown Swiss (big and grey), and Ayrshire (white with red/brown spots). A cow makes milk when she has a calf, and she will continue to produce milk long after her calf is weaned. Cows store milk in their udder, which looks like a four-compartment bag between their hind legs. Each udder has one teat, which is what is massaged so that milk will come out. On modern dairy farms, cows are milked in a place called “the parlor.” Cows are usually milked 2 or 3 times a day. Some cows can give 8 or more gallons of milk a day! When the cow goes into the parlor, the farmer washes the teats so that no dirt or germs get into the milk. The farmer then attaches a machine with four small vacuums—one for each teat—to the cow. It takes about 4 to 6 minutes to milk each cow. After the cow is milked she goes back to her barn or pasture, and is offered plenty of food and water so that she can continue to make the delicious milk that we all love! Ever wonder what a horse looks like on the inside? Come see our specially painted horses to visualize the skeleton and organs of a real live horse. Did you know that horses wear shoes too? Horses have a hard, protective layer covering their feet called the hoof wall (corium)Farrier When hooves get too long, they need to be trimmed. Horses’ hooves should be trimmed every 6 to 8 weeks, depending on the horse’s lifestyle. A farrier is a person who trims horses’ hooves and puts on their shoes. Farriers use tools like X-rays and special shoes to make the best shoe for the horse, so each shoe is tailored to that particular foot. Horseshoes are nailed into the hoof wall to support the foot and protect it from the environment—which is why people wear shoes, too! Don’t worry: the nails don’t hurt the horses if they are placed properly. Actually horses can’t even feel them! Cows–like sheep, goats, deer, and giraffes–are “ruminants.” They all have special stomachs to digest their food. A cow’s stomach is made up of four compartments: the omasum, abomasum, reticulum, and rumen. The rumen is the largest compartment and the main place where the cow’s food is digested so the nutrients can be taken into the body To study how cows digest their food, scientists sometimes make an opening into the rumen “Fistula” is the word for a surgical opening made into the body By studying fistulated cows, researchers have learned what and how to feed animals so they get all the nutrients they need. Reptiles and amphibians can make wonderful pets, but they can be a challenge to care for. Each species has different housing requirements.turtle Some require high humidity and lots of UVB light. Others like it dry and dark. Come have a close encounter of the cold-blooded kind at the herpatology booth at Open House and find out more about these popular pets! Come visit the Kids’ Tent at this year’s College of Veterinary Medicine Open House! The Kids’ Tent offers a variety of fun activities and games for all ages! Activities include face painting, games, coloring, crafts and more! Pets can benefit from rehabilitation therapy, just like people! Rehab can help to strengthen muscle and improve joint mobility. An underwater treadmill is a valuable tool used in veterinary medicine. Buoyancy of the water reduces pressure on painful joints, while still providing resistance to improve muscle strength. An underwater treadmill is commonly used in patients with moderate to severe osteoarthritis. Service dogs are specially trained to assist people with hearing, visual, and other disabilities. These special animals will demonstrate the many ways theycan provide invaluable assistance (e.g., turning on lights, picking things up). Visitors will also learn about service dog training and regulation. Sheep and goats produce lots of everyday things that you might not realize. Goat hair and sheep’s wool are used to make clothing, blankets, and even carpet. The process of getting wool off the sheep is called shearing. Goats and sheep also provide us with milk and cheese. Outside the United States, goat milk is more popular than cow milk. The milk from goats is often used for other animal babies, like foals, piglets, and even human babies. A female goat is called a doe; her young is called a kid. A female sheep is called a ewe, and her young is called a lamb. Sheep meat is a good source of nutrients. Lamb meat comes from a sheep less than 1 year old; mutton is meat from a sheep older than 1 year old. New Zealand is the country that uses sheep for meat the most. There are 914 different types of sheep and about 100 types of goats! It is not true that goats eat cans. They do eat the paper off the cans because they think it tastes good. Goats are browsers, which means that they like to eat leaves, twigs, vines, and shrubs. Sheep are grazers, which means they eat grass, clover, weeds, and other pasture plants. Sheep especially love to eat “weeds.” How do you tell the difference between a goat and a sheep? The easiest way is to look at their tails. Sheep tails hang down and are often docked (cut off) for health and sanitary reasons. A goat’s tail will go up (unless the goat is frightened, sick, or in distress). The Wildlife Medical Clinic will be displaying its resident raptors, which include: a Red-tailed Hawk, an Eastern Screech Owl, and an American Kestrel! Fun fact: American Kestrels are the smallest falcons of North America, but don’t let their size fool you—they are extremely fierce hunters! Interested in a career in veterinary medicine? Veterinary medicine takes 8 years of schooling: 4 years in a bachelors program and 4 years at an accredited veterinary school. Make sure you like science! This is the foundation for medicine. Many science courses are required to apply for admission to a veterinary school. Get involved now! It’s never too soon to ask your local veterinarian or shelter if you can help out. Get experience working with animals and make sure you really love it before making the commitment to a veterinary career What can you do with a career in veterinary medicine? Anything! Treat companion animals, ranging from dogs and cats to parrots, ferrets, iguanas, and more Care for horses, llamas, cows, or other large animals Provide medical and business consulting for food animal producers who raise beef or dairy cattle, pigs, turkeys, catfish, or more Study and manage wildlife populations and contribute to the conservation of natural resources Work in the area of public health with a local or federal agency such the Food and Drug Administration or US Department of Agriculture Conduct biomedical research that leads to health breakthroughs for people and animals Teach future generations of veterinarians Investigate the origin and nature of diseases by being a pathologist Watch the Illinois Vet Med Admissions Video. Read more about admission to the College of Vet Med. Aquatic animal medicine is an exciting and growing field of veterinary medicine. Veterinarians interested in aquatics can use their knowledge of ecology, conservation, and veterinary medicine to promote the health and well being of both wild and captive aquatic animal species. Did you know that over 70 percent of the earth’s surface is covered by water? Did you know that there are about 230,000 different life-forms—fish, plants, mammals—that inhabit our world’s oceans? Did you know there is a professional society, the International Association for Aquatic Animal Medicine, devoted entirely to the study of aquatics? Cats are not small dogs. Cats are fast becoming the most popular pet in America, with 90 million owned cats. There are now more cats than dogs in the U.S., and their owners spend over $6 billion a year on veterinary care. (Statistics from APPMA 2007-8 pet ownership survey) Because cats are an entirely different species than their canine counterparts, they require specialized knowledge of their specific health concerns. Cats have their own behavioral and nutritional needs, vaccination protocols, diseases they are prone to, and general health issues, such as obesity.A veterinarian armed with full knowledge of feline-specific medicine can help you keep your cat at its best. The Integrative Medicine booth is organized by student members of the Integrative Medicine Club. The Integrative Medicine Club (formerly the Holistic Club) focuses on learning to treat the entire animal in order to create a state of wellness. By combining all aspects of conventional medicine (antibiotic therapy, surgery, medical therapy, etc. ), as well holistic modalities such as acupuncture, chiropractic care, western herbs, eastern herbs, homeopathy, nutraceuticals, homotoxicology and rehabilitation the integrative practitioner has a wide range of tools in their diagnostic toolbox in order to help heal their patients. Integrative Medicine focuses on starting with modalities that are less invasive, less expensive and potentially have the least amount of side effects. Veterinary practitioners who practice an integrative approach to veterinary medicine have received outside professional training and certification in these areas. Come and learn about this new and exciting field of veterinary medicine by visiting our booth to see acupuncture demonstrations on stuffed animals, play “name that herb,” and learn about all the different modalities that integrative veterinary medicine has to offer you and your pet(s). Laboratory animal medicine is an area of veterinary medicine that has grown considerably over the past several years. As lab animal veterinarians, we have the goal and responsibility to ensure the proper care and use of all animals associated with laboratories. Human health, as well as the health of our pets, owes a debt to the various species involved in research. Our booth helps educate the public on how veterinarians are involved in the research process, the rules and regulations on animal usage, and how the many different animals involved in research enhance our lives and the lives of our pets every day. The Champaign County Humane Society Booth is a great place to learn all about how homeless pets are cared for until they are found new homes. The Humane Society is one of the nation’s largest animal protection organizations and works to create meaningful social change for animals by investigating cruelty, educating the public, advocating for public policies that benefit animals, and directly caring for thousands of animals at shelters and rescues across the country. Come to our booth to meet shelter pets, learn how to help animals of many species find new, loving homes, and learn responsible pet ownership tips such as: ALWAYS SPAY AND NEUTER YOUR PETS! Think about your life-style when you are deciding what type of pet best suits you and your family. Schedule regular checkups with your veterinarian to make sure your pet is happy and healthy. Basic obedience helps your pets learn good manners and can keep them safe. U.S. pork production contributes much to the nation’s economy. Illinois is currently the 3rd highest pork producing state after Iowa and North Carolina. Some of your favorite meats most likely come from pork products. For example, lots of the breakfast meats, such as, bacon, sausage and ham, come from the pork industry. Even your favorite pizza topping, pepperoni, comes from pigs! Pigs are the most intelligent domestic animal and are very easily trained. Additionally, they are considered a social species, and are happiest when interacting with other members of their own species. These two characteristics contribute to their high trainability, which makes them ideal animal candidates for mass production. Piglets are born weighing less than 2 lbs and reach market weight of 270 lbs within six months. If males are left to grow for several years they may reach weights of 900 lbs. Pigs have a digestive system similar to that of dogs, cats, and humans. Grapes and raisins can cause acute kidney failure in your dog? The colorful glow sticks that you bring home from fireworks displays are nontoxic – but taste very bitter and can cause heavy drooling? Antifreeze is very sweet. A pet that eats antifreeze should be treated immediately, even though it may appear normal for the first 12 hours afterward? Zoo medicine is exciting and challenging. Many zoos maintain collections of hundreds of species, and most veterinarians in zoos work on almost any animal you can think of. On any given day, a zoo vet’s patients might range from fish and birds to reptiles and mammals, and sometimes even invertebrates! It takes a lot of knowledge and cooperation to treat the animals kept in zoos, so help from the zoo hospital’s medical staff and sometimes even help from other veterinary specialists (like dentists, eye doctors, or cardiologists) is important in keeping these animals healthy. Wild animals are tricky to work on. They often hide their illnesses as they would in nature to prevent being eaten by predators. Zookeepers become very familiar with the animals that they take care every day. They work closely with the vets to catch illnesses or problems as early as possible. Zoo vets also support and perform conservation research that will benefit wild and captive animals all over the world. Zoos play a very important role in teaching people not only about all of the amazing animals of the world, but about the importance of taking care of our earth so that these animals can continue to prosper in the wild. You may not realize this, but veterinarians play a very important role in protecting the health of humans as well as animals. This is because we take care of all sorts of animals, from the dogs and cats you love to the farm animals that end up in the grocery store. Many emerging diseases today are “zoonotic,” meaning they are transmitted from animals to humans and vice versa. Some examples of zoonotic diseases include food poisoning (Salmonella, E. coli), rabies, bird flu, mad cow disease, and parasites such as roundworms. Come check out our booth this year to test your knowledge on zoonotic diseases. You can also discover firsthand how easily germs can be spread by trying out our special powder that only glows under black light. You can even buy some of our friendly giant microbes while visiting our booth. Choose among the flu, rabies, E. coli, Salmonella, Giardia, MRSA, and mad cow disease! Does your dog jump up on you, bark excessively, or chew on your things? Does your cat scratch your furniture? Have you ever watched an animal do something and wonder, “Why do they do that?” Behavior deals with what an animal does and why. Some behaviors are natural or instinctive, while others are learned. Why is behavior so important in any species of animal? If you know what normal behavior should be, you can recognize abnormal behavior. Abnormal behavior can tell you when an animal is sick, is unhappy, or needs something. All animals—people as well as other animals—learn from everyone around them from the moment they are born. An animal’s history can tell you a lot about why he or she might do certain things. Animals learn certain behaviors from us, even if we don’t mean to be teaching them! Animals don’t really know right from wrong like people do. Rather than trying to be naughty, animals that do something you don’t like are just acting in the way that they have learned works for them. Cancer is a disease where the body’s own cells multiply out of control. Although certain types of cells are more likely than others to become cancerous, any type of cell can turn into a cancer. Animals get cancer, too! And, as with humans, older animals are more at risk of developing the disease. As our animal companions are starting to live longer, veterinarians are starting to deal more with cancer. Veterinarians who specialize in diagnosing and treating cancer are called veterinary oncologists. Methods for treating cancer may include surgery, radiation, and chemotherapy. Sometimes a cancer (tumor) can be completely removed in a surgical procedure. Other times, special radiation machines are used in numerous sessions to try to damage the cancer cells beyond repair. And different drugs may be tried (“chemotherapy”) to target the rapidly dividing cancer cells. Cardiology is the study of disorders of the heart and blood vessels. Veterinarians use many different tools to observe and analyze the heart to see if it is healthy. A stethoscope is used to “auscultate,” or listen, to the heart to identify murmurs or septal defects (holes in compartments of the heart). X-rays can show the size of the heart and the appearance of the blood vessels to help diagnose diseases such as hypertrophic cardiomyopathy (an enlarged heart). An electrocardiogram (ECG) records the electrical activity of the heart over time to help the veterinarian diagnose cardiac arrhythmias (irregular contractions of the heart muscle). Ultrasound allows veterinarians to observe blood flow through the heart. Skin conditions such as red itchy rashes and welts can be caused by a variety of factors, ranging from something as simple as an insect bite to a mysterious skin allergy. Did you know that some pets are allergic to grass? Pets can have a “contact dermatitis” to grass, which means the skin touches or comes into “contact” with the offending allergy-causing item (grass) and an itchy rash or welts appear. Just like people, pets can also become sunburned and even develop skin cancer over time due to sun exposure. Sun exposure typically occurs on the bare or lightly haired areas, such as the tips of the ears, the nose and muzzle. Fleas are a common cause of itchy skin. Pets can be allergic to flea bites, becoming horribly itchy and uncomfortable—a condition called “flea allergy dermatitis.” Some common rash areas of flea allergy dermatitis include the base of the tail, the lower back, and down the legs. Once a pet is allergic or ‘hypersensitive’ to fleas, just one bite from a flea can cause an itching nightmare. Thus, the veterinarian must do detective work and take into consideration the rash appearance, rash location, time of year (summer time=happy happy flea time), broken/missing hairs due to scratching, and many other factors to determine the cause of the itchy skin condition…because one pesky flea can be a very hard flea to find! In the exciting and rewarding world of animal medicine, there is nothing sexier than emergency veterinarians. They make twilight house calls and deliver litters of babies. A puppy is struck by a car and is presented broken and shocky to the emergency vet by good Samaritans; life or death decisions must be made. The emergency vet commands the ER with the vision of a ship’s captain, always looking out for the fate of the ship, its delicate animal passenger, and its indispensable support crew, in what is a vast and powerful sea. Learn more about our Emergency & Critical Care services. Laminitis is a common, painful disease that affects the feet of horses.It is caused by the disruption of blood flow to the “laminae” within the foot, the part that links the coffin bone to the hoof wall. Severe laminitis destroys the laminae. Without the laminae, the coffin bone detaches from the hoof wall and sinks down. The change in the position of the coffin bone can be seen on radiographs. Do you know how long a horse is pregnant? How big the foals are when they are born? If not, then stop by the Equine reproduction and theriogenology booth at Open House. The booth will have some exciting pictures of newborn foals and even have some reproduction tracts to see where babies actually come from. Did you know that exotic pets need veterinary care just like cats and dogs? Exotic animals, such as rabbits, ferrets, guinea pigs, and other small rodents are becoming increasingly popular as pets. Just like cats and dogs, they need regular veterinary care. While some live only a few years, proper health care will prolong the life of our furry friends and make that time the best possible. Many exotic animals are hunted in the wild by larger animals, and they instinctively try their hardest not to show when they are sick or hurt. Owners need to pay close attention to their pets to catch problems when they start. Rabbits and rodents sometimes have problems with their teeth. Owners should be on the lookout for trouble eating, drooling, and general discomfort. Any condition that causes 24 hours of not eating should be considered an emergency! Additionally, all small mammals can get infections in the respiratory tract or gut. Ferrets can even catch our colds! In general, any lumps, bumps, sneezing, coughing, bleeding, pain, or anything that seems “off” should get your pet to a veterinarian that is experienced with exotics. Some of the most common surgeries on food animals relate to the bovine stomach. Cows have a four-chambered stomach made up of the rumen, reticulum, omasum, and abomasum. Cows might need surgery if their rumen gets too full and causes them to become bloated and have too much acid in the blood. The rumen contents are removed, and then the rumen and body wall are sutured closed. Cows may also need surgery if the abomasum gets flipped and twisted. To repair it, the abomasum is pulled back into place and sutured (sewn) to the body wall to keep the stomach from flipping and getting twisted again. Another common surgery is to castrate bulls. This keeps them from being able to breed and makes their meat better for consumption. Radiology is the process of using x-rays to generate pictures on film. x-raysRadiographs can be used to evaluate all parts of the body for various injuries or diseases including: the abdomen, the thorax, the head and neck, and the legs. Radiographs are evaluated based on the different “opacities” of the body tissues. Air is the least opaque material. It will show up black on X-ray film. Fat, soft tissue, and fluid are increasingly more opaque. Bones show up white. Metal is even more opaque; it appears whitest on X-ray film. Ultrasound uses sound waves. Sound waves reflect off organs, and a special machine called a transducer converts the sound waves into a picture. Certain organs are more “echogenic” than others, meaning they reflect more of the waves and therefore appear whiter on the screen. For example, in the abdomen, the prostate is more echogenic (whiter) than the spleen followed by the liver, and then the kidney. Ultrasound can be used to diagnose many diseases, such as cancer, and can also be used to evaluate pregnancies. Other imaging tools that are used at the University of Illinois Veterinary Teaching Hospital include nuclear scintigraphy, CT (computed tomography), and MRI (magnetic resonance imaging). blood chemistry analysis, and cerebral spinal taps. The ophthalmology booth at open house will provide an educational opportunity for the public to learn about eyes in animals. The ophthalmology booth will display anatomical and pharmacologic aspects of clinical ophthalmology in veterinary medicine. There will be cadaver specimens for the public to interact with and students will be teaching the public how the eye works. You probably knew that heartworms can live in the hearts of dogs, but did you know that first they spend part of their lives living in the salivary glands of mosquitoes? Or that a flea can jump 150 times her own length? That would be like a human jumping 1000 feet! Did you know that a flea also drinks 15 times her own body weight in blood every day? Fleas and heartworms represent just a few of the numerous parasites that infect our small and large animal friends and livestock species. Parasitogy is an important part of veterinary medicine, and veterinarians have many resources available to help them recognize the parasites that infect animals and design ways to treat and prevent infection. In addition, many parasites have zoonotic potential, which means that they can be transmitted from animals to people. This is another reason that parasitology is such an important aspect of veterinary medicine. So, come by the Parasitology Booth to learn more interesting facts about some of the most common domestic parasites, and some ways to help your pet live a life free of parasites. Have you ever had the flu or had a cut and wondered how your body responds to those injuries so that you get better? If so, then you asking the very same questions a pathologist asks and then tries to answer about each and every disease process that exists. Pathology is the study of disease and disease processes. Veterinarians use pathology to figure out what disease an animal may have, or what disease it may have died from. Knowing what disease an animal has helps the veterinarian know how to both treat the patient and prevent other animals (such as cows in a herd) from getting that same disease. As a matter of fact, veterinary students study all species, including dogs, cats, horses,…and even lions, tigers, and bears (oh my!). Pathology is an exciting field that bridges basic science and applied medicine. Many people describe pathology as the foundation of medicine. It is a field that focuses on all of the “why’s” and “how’s” of a disease process. Why not be a pathologist and help cure disease – one species at a time? Have you ever wonder why your cat or dog’s breath smells so bad? The small animal dentistry booth will answer these and other questions. Pets may have bad breath because they are not receiving appropriate dental care. Cats’ and dogs’ mouths harbor bacteria, just like human mouth, so it is just as important for them to receive daily tooth brushing and regular cleanings as it is for you! Periodontal disease—the buildup of plaque with bacteria on and between teeth—is one of the most common diseases affecting all cats and dogs. Luckily it is preventable. learn how veterinarians work to achieve predictable and consistent results through fracture fixation and healing. This exhibit let’s you be the surgeon. At the interactive hand-tie station, you can learn several knots and suture patterns that are used in dog and cat surgeries for various situations and tissues. X-rays are a very important veterinary tool used by surgeons to diagnose fractures, tumors, and foreign objects. Dogs and cats sometimes swallow non-edible items, such as quarters, rubber balls, and plastic toys. These foreign objects may lodge in the gastrointestinal tract and cause indigestion, vomiting, and diarrhea. At this booth, children can try to locate a foreign object on an X-ray. They will then gown up in full surgeon’s gear. A gown, cap, and gloves are used by surgeons to maintain high levels of sanitation and sterility. This will help to minimize the spread of diseases and bacteria between people and animals. The children can then “perform surgery” on a plastic canine model to remove the foreign object. The Christian Veterinary Mission Fellowship (CVMF) is a group of students and faculty members who gather together weekly to grow in faith and fellowship through bible study, prayer, and Christian videos and discussion. CVMF is part of a national organization based in Seattle that provides conferences where students and veterinarians from across the country meet to share the wonderful ways in which they live out their faith with veterinary medicine. We also are active in short-term mission trips, and some members served in Honduras in the summer of 2007. The group is currently planning other trips in the U.S. and overseas in the upcoming years. We also are active in the community through Big Brothers and Big Sisters and Empty Tomb as well as providing local pet sitting services. Currently, we are engaging all clubs at the vet school in competing to see who can raise the most funds for Heifer International, an organization that works with communities all over the world to end hunger and poverty and to care for the earth. Please stop by this booth to see what we are all about and to purchase some tasty baked goods; all proceeds will go to Heifer International. Come visit the ISCAVMA booth to learn how the many veterinary organizations help their communities learn about animal health. Did you know that organized vet med helped rescued over 3,000 stranded pets during hurricane Katrina in 2005? They also provided help to the residents of the area that refused to evacuate without their pets, and American Veterinary Medical Association (AVMA) offers disaster preparedness and response information for veterinarians and their clients and patients. Did you know that the Illinois State Veterinary Medical Association (ISVMA) provides information for people about how to choose a veterinarian, a kennel for boarding, and a support line to help people deal with the loss of their pets? Did you know that in February 2008 the Illinois Student Chapter of the AVMA donated 18 stuffed dogs from the Josh Project to children at a nearby hospital? The students had raised the funds over two years for this purpose. This booth is also a good way for prospective veterinary students to learn how veterinary organizations help protect the jobs and rights of veterinarians across the country Did you know that AVMA is a legislative advocate, as well as an informational and advisory resource to government agencies and other organizations on issues related to veterinary drugs and biologics, zoonotic disease control, food safety and other issues related to animal and human health? Did you know that ISVMA is working to pass a bill that would provide loans and help debt repayment for students interested in large animal, mixed animal, or public health careers in Illinois? Omega Tau Sigma is a professional service fraternity unique to schools of veterinary medicine. The Illinois Theta Chapter is one of thirteen chapters across the nation which works to promote service, brotherhood, friendship and professionalism among its members. At the University of Illinois, we are no exception. The Theta Chapter works hard throughout the year to raise money for multiple local organizations that represent the strength of the human-animal bond. Whether it be through pet visitations at local elderly homes, pet washes benefiting humane societies, road races promoting furry family fitness or supply drives gathering donations for homeless animals, OTS does everything possible to make an impact in the lives of people and animals here in Illinois. Look for photos of our monthly team-building and fundraising events on our website at https://vetmed.illinois.edu/ots/ or contact our fundraising committee at illinoisots@gmail.com to work with Theta members in helping your local organization. This year, the members of Omega Tau Sigma invite you to come visit us at our Wild Wild West booth outside in the courtyard. Children of all ages will have the opportunity to step back in time to a long-forgotten mining town in the Southwest and live to tell the story. Bring your southern drawl and campfire songs along as we teach our cowboys the history of the miniature horse in America’s Gold Rush era. Come visit us – proceeds will help local humane societies and rescue groups in Champaign and surrounding counties. Virology… Cardiology… Surgery… Ophthalmology… Dermatology… Nutrition… Anatomy… Bacteriology… Immunology…The list goes on and on! The veterinary medicine curriculum is filled with dozens of required classes enhancing the medical knowledge needed to be a successful veterinarian. However, another aspect of veterinary medicine exists that seems to be overlooked in this difficult curriculum: business management. You might wonder how many business management or economics classes are required for the Doctor of Veterinary Medicine degree. Currently, the national curriculum doesn’t require any business classes to be completed upon graduation. The Veterinary Business Management Association (VBMA) is the perfect organization to fill that very important and often overlooked curriculum void. As young veterinarians we will graduate with plenty of confidence in the medical and surgical areas of medicine but for many, the business aspect of veterinary medicine is far beyond our understanding. Fortunately, through the VBMA, the University of Illinois offers real information to its students seeking help regarding owning clinics, paying off loans, and interviewing. The VBMA’s mission statement includes “advancing the profession through increasing business knowledge, creating networking opportunities, and empowering students to achieve their personal and professional goals.” The VBMA believes that in order to practice quality medicine, veterinarians need to possess subsidiary skills to enhance client compliance and personal success. As a relatively new club (2001), the rapid growth of the VBMA signifies the need for veterinary students across the country to look outside the science curriculum for answers to their management questions. In less than 5 years the VBMA has established a chapter at every single veterinary school in the US with almost 2500 members as well as three international chapters. High quality medicine is the backbone to a good veterinary clinic, yet high quality business management skills and understanding can transform a good veterinary clinic into an exceptional one. Come check out our booth to learn more about this nationally-known and respected student-run club! VSOP is the Veterinary Student Outreach Program. We are a group of student volunteers that support the mission of education as a key contribution Veterinary Medicine can make to the community. The group strives to provide the community with information about topics related to veterinary medicine, such as bite prevention, proper pet care, and when a pet may need to see a veterinarian. In addition, VSOP explores with groups the science of Veterinary Medicine, covering things like comparative anatomy, epidemiology and the biology of wound/fracture healing. We also offer ideas about the broad spectrum of careers that are available to people who earn the Doctor of Veterinary Medicine degree. For a list of programs we offer, or if you would like a program created for a special topic your group has in mind visit our website: https://vetmed.illinois.edu/asa/vsop/index.html. Stop by our booth at Open House to say “hi” to some our furry educators and test your knowledge about bite prevention!